Hello, everyone! Today is all about the hair and skin. I have very curly hair which most people do not know because I always wear it straight. Why? Well let’s face it frizz comes along with extremely curly hair which I personally hate. It is FINALLY Spring and I am so pumped, time to pull out the shorts. Now with wearing shorts we always want to moisturize our legs or arms if you wear tank tops a lot (I do). These products will help with both of these things. 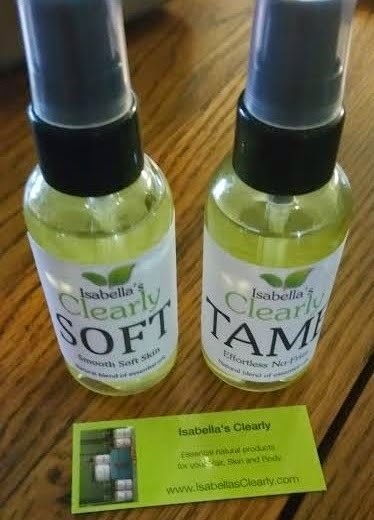 I was sent 'Clearly Tame Effortless No-Frizz' and 'Clearly Soft Smooth Soft Skin' from Isabella’s Clearly from Etsy. The labels on both products have instructions on how to use, ingredients and a caution label. The instructions on both of these products are thorough and to the point-- there is no question on how to use them. They are both in a nice pump bottle so these products are so easy to use, which I LOVE. Starting with the 'Clearly Tame Effortless No- Frizz', this is more of a serum consistency but for your hair and a little thicker. I know all of you fellow curly haired girls or women have tried so many anti -frizz products and let me say you can stop looking now! I never thought I would find a product that could control my frizz but I finally have. This is super easy to use all you do is pump some of the product into your hand and go over your hair with it. I would suggest doing this after the shower, I used a towel to semi dry my hair before using this as per the instructions. I really had no issues with frizz when I used this product, now if it is humid and raining nothing is going to calm the frizz all the way but this definitely will help. I used this product when I had my hair curly one day and I used it when I straightened it. I just wanted to see if there would be a difference and there was. The day I had my hair curly it was just pretty curls no frizz or fly away pieces at the top of my head. The day I had my hair straight it was very shiny and soft, I noticed no frizz during the day it pretty much stayed straight all day without getting big hair from frizz. I would recommend this product to absolutely anyone with any hair type. If you have very oily hair there are instructions on the label on how to use this so it won’t make your hair oily. I have said before that I do have oily hair but it does not get overly oily using this product. 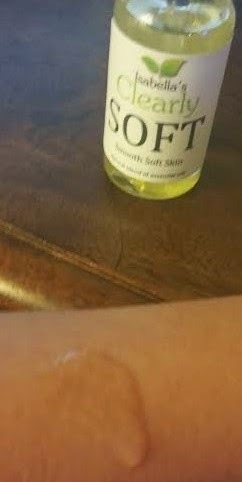 Now I LOVE the 'Clearly Soft Smooth Soft Skin'! 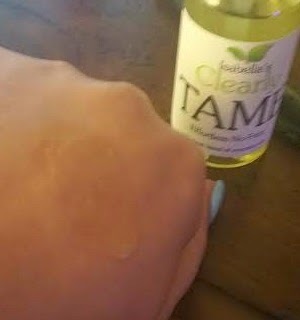 This product is really amazing, it feels more oily when going on the skin but when you rub it in it soaks right into the skin. I would honestly choose this product over lotion any day of the week. The reason I say that is because it leaves behind such a nice glow to the skin, Not an oily glow, but a healthy glow. I get spray tanned on a regular basis lately or use self-tanner and this product just really showcases that tan, and I absolutely love that. Now if you do not use self-tanner or tan at all I would still use this product because it really moisturizes the skin, which we all need. It really does make your skin so smooth and soft. Did I mention that it just smells so good! The fragrance is not strong-- I honestly cannot even really smell it unless I put my nose on my arm (which I do constantly when I put this product on, I really like the way it smells). It just smells very fresh with a hint of mint. LOVE IT! I would recommend these products to anyone, I have used the No-Frizz on my hair and my daughters hair, and it worked great with both of us (her hair is straighter than mine, naturally). The Clearly Soft is AMAZING. I personally think this should be a necessity in every woman’s life. Both of these products go for around $22.98. 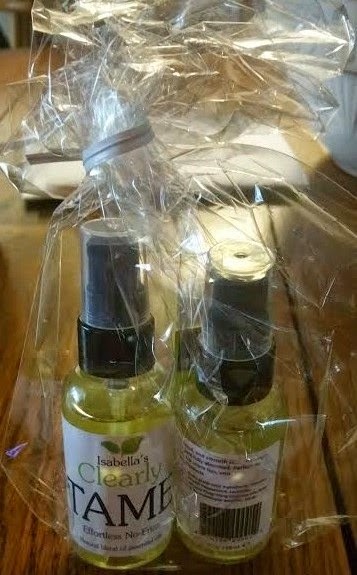 Please check out Isabella’s Clearly on Etsy.